At HolidayExtras.com® we have six great East Midlands airport hotels that will ensure you get a restful nights sleep before the excitement of your holiday. 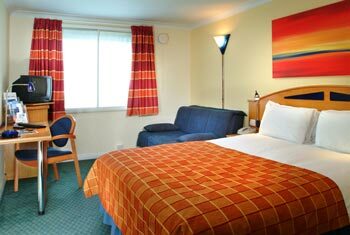 With our cheap East Midlands airport hotels you are sure to find the perfect hotel at a price you can afford. Even better, with our Best Price Guarantee and pre-book savings of up to 60 per cent, a luxurious start to your holiday is more affordable than you might think. Why pre-book your airport hotel? When it comes to those essential extras that make your trip that much more enjoyable, booking early is a must. Its such a simple way to save money that its our top tip when booking add-ons. Hotel prices tend to rise as they get booked up so the nearer to departure day you book your hotel the more expensive it is likely to be. This means that organising your airport hotel or parking in advance is an easy way to save some money and make your trip a little more wallet-friendly. By pre-booking your hotel at East Midlands airport you could save yourself up to 40 per cent of the price. Well worth the planning we think youll agree. How else can I save money on my hotel stay? If youre booking East Midlands airport parking then weve got another fantastic money saving tip for you. Booking your airport parking separate from your hotel stay can often cost more than the hotel alone.. By booking one of our great value hotel and parking packages you could avoid this and save yourself some money. You can also make guaranteed savings on your East Midlands hotel stay by booking one of our undercover airport hotels. This adds an exciting element to your booking whilst at the same time saving you money. Youll still be booking one of our superb 3-star or 4-star hotels but the twist is that we keep the identity of your hotel a secret until after your booking. So why not add a little hotel mystery to your holiday while you save? Our 3-star hotel selection is the perfect choice for those looking to enjoy a relaxing nights stay surrounded by all the mods cons. The Express by Holiday Inn is conveniently located less than a mile from East Midlands airport making transfer effortless, and offers all the quality and comfort you would expect from one of the world's leading hotel brands. Or if you're looking for clean and functional accommodation on a budget, you can't go wrong with the Travelodge Hotel East Midlands Airport. If, however, youd rather start your holiday with a little style and luxury, our 4-star hotels are for you. With its ideal location and wealth of facilities it's easy to see why the Thistle East Midlands Airport is one of our most popular 4-star hotels. It also carries one of the lowest price tags, making it even more attractive. 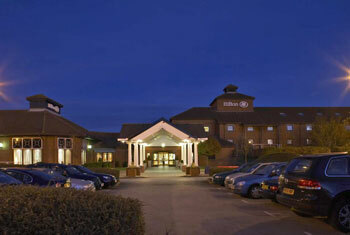 Another of our popular 4-star hotels is the beautifully furnished and conveniently located Hilton East Midlands.